So, if all limited slip differentials work by creating friction, what makes them different? That’s a good question, and is the key to what sets Torsen® apart. Yes, as we said before, all LSDs generate friction. But not all do so in the same manner or to the same extent. A typical, basic, clutch style LSD uses a set of clutch plates between the side gears and differential case to make friction. Normally, the load on the clutches comes from a preloading spring, placed between the gears. This type of product is fairly easy to build and is inexpensive. However, in most cases the amount of friction they create is fairly low. Also, the amount of friction is constant, changing very little over the range of conditions the vehicle operates in. That means at high and low speed, straight or turning, the clutch plate differential always behaves the same – for better or for worse. This fixed friction amount – which helps reduce tire slip when accelerating – hinders turning the car into a tight parking space. The chassis has to overcome the binding this friction causes, making maneuvering the car tougher. In poor weather or slippery conditions, this can be especially true. On the other hand, a helical gear limited slip differential – like Torsen® – does not rely on clutch plates*. Instead, the helical gears themselves generate friction. When a helical gear receives a torque load, that torque creates thrust forces that want to push the gear in an axial direction. When you mesh several of these gears together with a torque load on them, it creates mesh separation forces which try to push them apart, away from each. 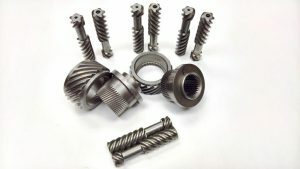 If you then contain all those gears inside a fixed, rigid casing (to prevent them from sliding or pushing apart) the result is friction between those gears and casing on the surfaces where they meet. As more torque applied, the greater the forces become, resulting in a greater the amount of friction. There is a certain elegance to this; friction is generated proportionally to the magnitude of load applied. Under high load – when accelerating out of a corner on a race track or on a highway entrance ramp – the differential offers a lot wheel spin resistance. This allows the driver to put a lot of torque to the tires and really get the car moving. Additionally, under very high load situations like this, the Torsen® will actually maximize the traction of the inside tire and put all extra torque to the outside tire. This not only provides optimal traction, but also helps drive the car around the curve by inducing an understeer-canceling, positive yaw moment about the car. You’ll actually be able to feel the Torsen help propel the car through the turn. But, under low load – pulling into your driveway or into a parking spot on an icy lot – the differential offers little resistance and will differentiate freely. This allows the car to maneuver easily, making for better balance behavior characteristics and a car that is more driver-friendly. On the other hand, clutch-type LSDs can become difficult to maneuver in this situation. These benefits allow the Torsen to be as much of handling aide as it is a traction aide. The development of the Equvex II gear design helps set Torsen® even further apart, featured in second generation T-2R models. Equvex II employs a technology we refer to as Split Gear. A true helical gear design, this allows the differential’s locking characteristics to be easily reconfigured. Previously, once a helical gear differential was designed, its properties were fixed. Aside from playing with lubricant to affect change in the locking performance, there was nothing you could to change it if requirements changed. You had to start over, from the gearing up because once the basic geometry changed, the casing had change as well. If you had significant investment in tooling to produce the product, that was too bad, because you’d have to retool it all over again. Enter the Equvex II & Split Gear. With Split Gear technology, the side gears are comprised of two concentric pieces. A spline joins these pieces. This allows more efficient use of the differential’s friction surfaces. An existing design can be re-tuned without any significant retooling, just by changing the helix angle on that spline. This allows us to offer multiple levels of performance of a common product family. This allows costs to be spread out, since the expensive tooling is shared. This gear design, frankly, offers an unparalleled level of design flexibility that no one else in the industry can match. And we offer it to aftermarket customers as well as OEMs. All new and upcoming T-2R models will make use of Equvex II gearing. That allows us to tailor the TBR to the needs of that specific application, instead of applying a one-size-fits-all method of enhancing performance. Existing designs will retain the previous multiplate arrangement. When stock is depleted for these older models, a revised design will be introduced. And although Split Gear is just arriving on the aftermarket scene, it has become proven technology. When it was introduced for 2012, the Ford Mustang Boss 302 was the first to use this design . GM also adopted the Split Gear design for the late mode Camaro Z/28. Today, the Mustang GT with Performance Pack option continues to employ a Torsen T-2R with Equvex II gearing.